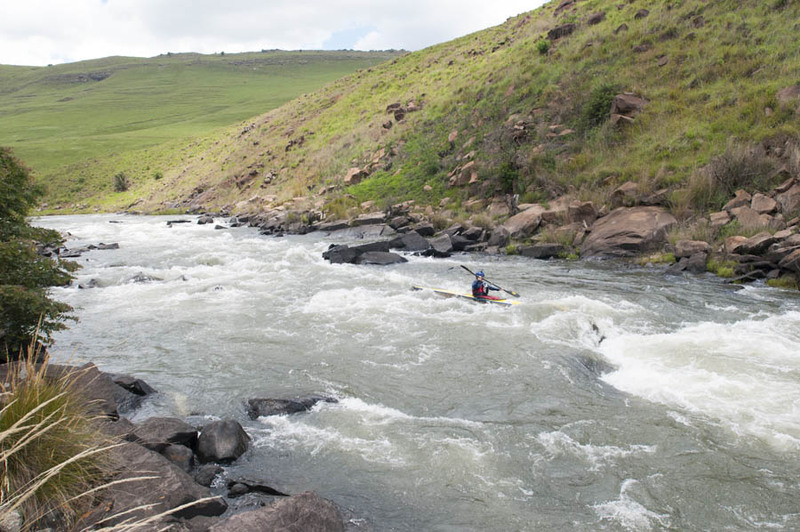 Tokolosh, or slalom rapid, signals the start of The Underberg Gorge, and is great fun! At a full level it will throw up some big waves but at a lower level it is just as much fun, with some rocks that need to be skirted in the final section. Approach it just left of centre, aiming just right of the lateral wave in the first drop (where the water curls off the rocks on the left). Then bomb straight through the mid section with great waves. In lower river conditions there is a large rock in the centre of the river that is best skirted on the left. In medium river conditions you can paddle over this rock and hit the wave, but at a full level this becomes a very strong pour-over that should be avoided. The rapid has opened up somewhat down the right, which is a safe option in full river conditions.